In the White Paper published in February this year (“The United Kingdom’s exit from and new partnership with the European Union” Cm 9417), the very first point made was that the “Great Repeal Bill” will “remove the European Communities Act 1972 from the statute book and convert the ‘acquis’ – the body of existing EU law – into domestic law”. It was said that “[t]his means that, wherever practical and appropriate, the same rules and laws will apply on the day after [the United Kingdom] leave[s] the EU as they did before”. First, it will repeal the ECA and return power to UK institutions. Second, subject to the detail of the proposals set out in the White Paper, the Bill will convert EU law as it stands at the moment of exit into UK law before we leave the EU. This allows businesses to continue operating knowing the rules have not changed significantly overnight, and provides fairness to individuals, whose rights and obligations will not be subject to sudden change. It also ensures that it will be up to the UK Parliament (and, where appropriate, the devolved legislatures) to amend, repeal or improve any piece of EU law (once it has been brought into UK law) at the appropriate time once we have left the EU. All who have given any serious thought to the issues agree that the devil is in the detail. Yet there is no published indication of what, if any, attempts have been made to frame the provisions that will give effect to these purposes. All that was done in the second of the White Papers was to identify three “case studies” which were said to indicate issues that would (or at least might) arise under “preserved” EU law. The only solution proffered is to give power to make secondary legislation that could amend, repeal, or “correct” the relevant law. What is to happen in the period between preservation and amendment, repeal or correction is left unexplained. Of course it is right to observe that, until withdrawal negotiations are complete, no‑one can be sure of what exactly will be necessary. But that does not mean that the framework cannot now be planned in much finer detail than the White Papers reveal. And it certainly does not mean that the drafting should not now begin. The “Great Repeal Bill” is legislation of fundamental constitutional significance. It must make a radical change in the legal system by cutting off what has been a prolific source of law, preserving much of the law that came from that source (making some necessary modifications to it) and providing for how that preserved law is later to be changed. The legislation deserves as much time, care, and effort as can possibly be given to it. To draft it in terms which preserve constitutional structures and principles will require clear identification of how and why it is framed as it is. To draft the legislation in terms which command the assent of the people calls for much wider exposure of the drafting processes than any other legislation in living memory. The best constitutional drafting is simple and muscular. It avoids entanglement in the weeds of detail by clear articulation of the principles which are given effect. To draft the “Great Repeal Bill” clearly may require repeated re-writing of its text. Too easily, the draft will become bloated with unnecessary detail added “for the avoidance of doubt”. It is time to make a start. The “start” is to propose a bill for an Act of twelve sections — see A Draft Great Repeal Bill (.doc). Three clauses (cl 2, 3 and 4) seek to preserve the law as it stands at the time that the United Kingdom ceases to be a member of the EU. Clause 5(1) carves out six exceptions to that general preservation. The exceptions are described; they are not specifically identified. The exceptions are intended to capture those provisions which it would be incongruous to continue to apply after the United Kingdom has ceased to be a Member State of the EU and has ceased to be a Member State of the several European Communities. It is drawn on the assumption that the United Kingdom will make a complete break from all European institutions. Of course, if a different outcome is negotiated, the exceptions described in cl 5(1) would have to be modified. Clause 6 may be a bridge too far. It seeks to substitute equivalent United Kingdom institutions for European institutions that are mentioned in the instruments which give rise to the rights and duties preserved by cl 2 of the bill and the instruments which are the subject of provisions made under s 2(2) of the European Communities Act 1972 dealt with by cl 3 of the bill. At least some attempt should be made to draft a general provision of this kind. Clause 7 seeks to grapple with the interpretation issues that would otherwise arise by inviting attention to how relevant instruments would have been construed and applied if the new provisions had not been enacted and by reference to relevant decisions made before the new provisions come into effect. Clause 10 seeks to deal with future modifications of the preserved law. It does not expressly deal with how those modifications are to be made. But it does seek to engage notions beyond the essentially mechanical application of principles of express or implied repeal. Those principles will apply in any case. If a later law repeals a preserved law, either expressly or impliedly, no further inquiry will be needed. But when the field of preserved law is as wide‑ranging and complex as it is, it is inevitable that later enacted laws (whether subordinate legislation or statute law) may not deal expressly with all aspects of the preserved law with which it intersects. Finally, cl 11 and 12 make some transitional provisions. Perhaps other transitional cases can be identified and, if they are, suitable transitional provisions should be made. As is implicit in what has been already said, it is undoubtedly possible to approach the drafting of the “Great Repeal Bill” in many different ways. Some of those approaches would see much more detail in the bill than there is in this draft. But this draft seeks to focus the minds of the readers upon, first, the principles to which the “Great Repeal Bill” should give effect and second, the way in which those principles might best be carried into effect. Both the principles and the means by which effect is given to those principles call for much closer consideration than appears readily from what has been published so far. Along the way there is much scope for debate about what can or cannot properly be left to subordinate legislation. More particularly, I would expect there to be a lively debate about the proper place of so‑called Henry VIII clauses. There is much scope for debate about devolution and the place of the devolved legislatures. (This draft speaks generally of later laws, without seeking to distinguish between laws enacted by or under the authority of a statute passed in Westminster and laws made by other legislative authorities. Laws made by the devolved legislatures would operate according to their terms and have the operation of any other devolved legislation.) Debates about subordinate legislation and about devolution are critically important, but they cannot be allowed to swamp all other issues. It is hoped that this draft may serve to point out that there are other issues of principle which demand attention and resolution sooner rather than later. K M Hayne, Honorary Professorial Fellow, Melbourne Law School, The University of Melbourne. 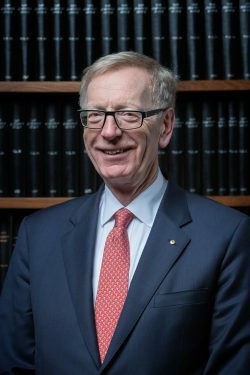 A Justice of the High Court of Australia, 1997-2015. We have already seen how this Government is prepared to take a straightforward issue (Leave the E.U. or Remain in the E.U.) and reinterpret it in myriad forms – often completely unrecognisable from and unrelated to the original issue. With this unacceptable track record, perhaps it might be time well spent to also make clear what a new instrument DOES NOT do, so that its limitations are not open to further misinterpretation and abuse once accepted. If one captures all that EU legislation, presumably, rights and obligations must similarly be brought over with it. The challenge of picking things apart begins with the detail itself, before your exclusionary principles could apply including ss6 and 7. Consider mutual recognition of qualifications, a single market feature. It does impose an obligation on member states in various ways and is a feature of free movement. To exclude it would of course mean that mutual recognition would cease to apply, so how does one ‘repeal’ it in the Great Repeal Bill without keeping the obligations which fly in the face of the very intent of departure? More generally, the real merits of abolishing mutual recognition will be that UK professional qualifications, such as of lawyers, will cease to be recognised outside the UK. In my field, healthcare, you can imagine the consequences of failure of mutual recognition in the recruitment of doctors or nurses from the EU; oh, silly me, I forgot, the government doesn’t want any more immigrants, especially highly qualified ones from the EU as that would require mutual recognition — seems like carelessness to me. I suspect there would be sufficient certainty in a negotiated ‘independence’ to buy off the claimed ‘will of the people’ and keep industry humming along, even if it destroys the social relationships people have across the EU — a small price to pay. However, as a person who thinks leaving the EU is mass group think (in the psychological sense), the Great Repeal Bill should really be the Great Mistake as seen from the Brexit side — they shouldn’t want any of this. On the other hand, this Bill may be the Great Salvation that saves the nation from itself. Nice thinking, but this (U.K.) nation has proved itself incapable of saving itself from itself! The Tories deliver nice, neat little slogans like “the coalition of chaos”, and the general public buys into it, hook, line and sinker – even the obvious lies – then it repeats the same mistake! Unbelievable! If you need evidence, wait for the next G.E. results – due shortly – and watch the country buy-in to another five years of austerity, dwindling NHS, and schooling chaos. It can’t see beyond its nose! Whether it stumbles into a Great Salvation is extremely unlikely in my view. This Government’s track record isn’t too promising. And it knows exactly what it is doing. Salvations aren’t in the script! This entry was posted on April 12, 2017 by Constitutional Law Group in Europe, European Union, UK government, UK Parliament and tagged Brexit, Great Repeal Bill.